Ever wondered why a “bucket list” is so-called? The answer arises from the expression: “To kick the bucket” ~ meaning to die. Our Keiko has had a bucket list that he’s been working his way through for a couple of years. When we were last away, though, it dawned on me that we had yet to prepare a dog’s bucket list for our newest furchild Summer. 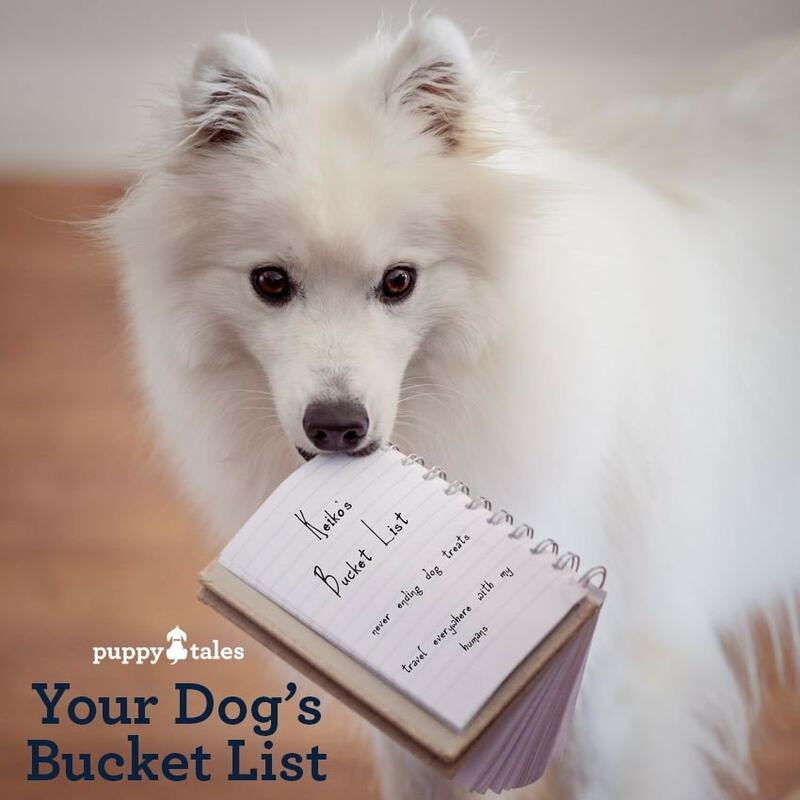 As I set about doing this I thought that I could share our thoughts and ideas….. and also the beautiful template I created – which you can totally personalise for your own dog’s bucket list! Why have a Bucket List for your dog? Ever noticed how quickly time passes? One day you pup could cuddle on a cushion, now he spreads over the whole sofa. A bucket list focusses the mind and helps you make the most of those precious, but all too fleeting, years that you have together: Think of it as a checklist for sharing experiences and having fun with your furry shadow, so that you both live life to the full. Of course, make sure the emphasis is on doing things you dog enjoys. Whilst skydiving and white water rafting may be high on your bucket list, they’re more likely to make your four-legged friend turn grey rather than give them sweet dreams. Creating a bucket list for your dog is a great way to stretch your imagination and make sure your dog doesn’t miss out on the rich variety of possibilities that life has to offer. A bucket list is a challenge and a way of avoiding getting stuck in a rut, taking that same familiar walk morning and evening, day in and day out. It means you are never short of ideas for what to do next, plus there’s a sense of satisfaction for having seen or achieved the next item on your dog’s list. As the old saying goes, “It’s not about the destination, it’s about the journey”. This is also true with your dog’s bucket list. By going new places and having an adventure you learn more about your dog and grow closer, plus you both get to meet interesting people and dogs you wouldn’t otherwise meet. Having a bucket list is also about having fun, with a furry “F”, and not wasting a moment on regret for things not done. Live life so that you can look back and say your dog led a truly fulfilled and active life. But if a bucket list strikes you as a ticking clock, something for an old dog marching down towards the end of life, remember this is something for all ages. Don’t wait until time is limited to fur-fill those long held ambitions, start when your dog is a youngster for a truly adventurous journey together. OK, so you’re raring to go and about to grab your wetsuit to take your dog surfing. Sit down and think “Dog”. Does it put my dog in danger? Does it put other people or dogs in danger? Does it contravene local law? Does it comply with responsible pet parenting? Would my dog enjoy it? Most importantly, if the activity isn’t going to cause your dog’s tail to wag with delight, then ditch the idea. Also, book a visit to your veterinarian for a full overhaul of your dog’s health before you start. If you have any particularly outlandish plans, such as feeding him hamburgers for a week, have a chat to your veterinarian to see if it’s advisable (which the hamburger diet definitely isn’t) and that your dog’s health won’t suffer as a result. In other words, match the bucket list activities to your dog’s age, fitness levels, and personality. Remember, a short meaningful list is much better than a long, poorly thought out one. OK, so enough health and safety, let’s seek some inspiration. Consider what makes your dog tick and use that as a starting point. Here are just a few ideas to get your creative juices flowing. You know your dog best, so sit down and brainstorm what he loves most, be that sniffing, eating, playing fetch, or meeting people. For example, if your dog is highly food motivated you might have “gourmet” or “eating” bucket list items. Have breakfast in bed…with the hoomans! Go with you to work with your hoomans. Teach your dog a job to do (perhaps fetching the TV remote). I’m sure you get the idea and have some great items to add to a bucket list for your own dog. If you’re itching (like a dog with fleas! ), to get going with a bucket list, I’ve created a fabulous template in Canva to help you. You can personalise the template with your own dogs name, photo and their bucket list items. When you’ve done so feel free to pop back over and share in the comments what you create for your dog with us – we’d love to check them out!